Donna at Bay Photos by Donna recently shared some amazing photos she took in Florida while on vacation. Normally, she focuses on birds…..but lately she’s thrown in alligators, and cows! This is another image that keeps drawing me back for more abstract paintings with those Neocolors by Caran d’Ache. It’s hard to describe how hooked I am on these things. I used to love coloring with crayons as a little kid. This is like that, but a million times better, because they’re water soluble! Imagine vibrant, buttery smooth color with no fuss, no mess, and yes, lots of fun! I hope you have a Super Happy Tuesday today and that you find time to play, in whatever way brings you the most joy. Peace. And I loooovvveee it! Love the colors you did it in! What a bright happy wake up!!! Ummm “buttery”! What a beauty! Love it! Such a sweet cow. Thanks so much Rachel! I just love them. Sweetest faces! Thanks so much, Claudia! So glad to bring some sunshine in this morning! Now I have to join in the bovine humor and say this is udderly beautiful! lol, thanks Kathy! 😀 Glad you think so! Aww, thanks Rebecca! 😀 I’m really hooked on the bright warm colors this February. hehe, thanks C! 😀 So glad you enjoyed her! Teri, I only wish my job was to be a Caran d’Ache rep. I love their stuff (what I’ve tried, so far). I just can’t seem to stop! So glad you enjoyed it! Yesterday I bought some water soluble crayons! It’s all your fault!! lol😄 You’re right, they’re amazing fun. Lin, I can’t wait to see what you do with them! So glad you’re loving them already! 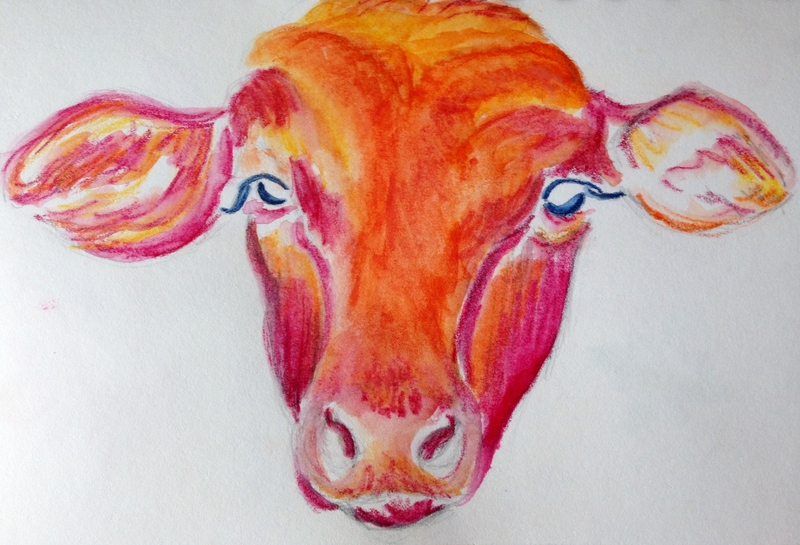 I wish cows were red. I like your blending techniques and beautiful dimension. Bravo Laura. My first purely acrylic painting posts in the AM! It’s 100% abstract but even Vic likes it (he usually only likes realistic or at least semi-realistic stuff). 💜 Dying to see what you think! Thanks, Haunani! So glad you enjoyed her! Great cow Laura, you capture this eyelashes. I had a pet cow called Betty when I was a kid and she had eyelashes just like that. Aw, thanks Denis! Her eyelashes were so beautiful. It’s interesting the things you notice on such a big animal! Thanks! It was really fun making that one. I just love faces of all kinds! And eyes. Lol I have trouble with that too, which is why I do my fair share of partial faces. I love the first eye and almost dread the second one lol.